Perfect for placing either side of doorways, pathways and entrances or for the patio. The silvery grey foliage and blooms are packed with a heady scent, the dark purple flowers will provide you a colourful spectacle from early to mid-summer and are a magnet to bees, butterflies and other beneficial creatures. Once established, a lavender plant is extremely drought tolerant. With very little maintenance needed, you can keep it in great shape with a little pruning twice a year; trim lightly in mid to late summer, removing spent flower heads. Prune again in early spring, removing about 2.5cm of growth. Supplied in wicker baskets as shown. 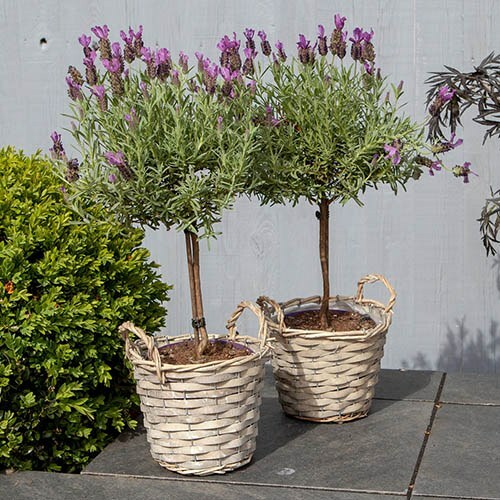 Perfect for placing either side of doorways, pathways and entrances or for the patio, lavender is perfect in many a scenario and French lavender is one of the prettiest and eye-catching varieties thanks to its lilac bracts that sit atop of its purple flower head. Once established, a lavender plant is extremely drought tolerant. With very little maintenance needed, you can keep it in great shape with a little pruning twice a year; trim lightly in mid to late summer, removing spent flower heads. Prune again in early spring, removing about 2.5cm of growth. Supplied as a pair of approx. 50cm tall standard plants in 15cm pots.